Korn also maintains a gluten-free diet, which she said helped dramatically to reduce her symptoms of thyroid disease. So gluten attacks the immune system, fuels migraines and thyroid disease? Lovely! From the research I’ve done on gluten and it’s effects on the body, I’ve basically become more confused on whether it’s bad for people or not because there is so much conflicting data on it. But I agree that my digestive issues have settled a lot since cutting out processed foods containing gluten, though I’m not 100% gluten free. Eating it close to it’s natural form seems to be fine, but processed forms tend to cause more digestive trauma and energy sags for me. Promoting a vegan, mostly raw diet, he admits to gardening naked and recently endured a 40-day fast. He and his wife erected VoiceYourself.com, a portal to educate and inspire eco-activists, which he often blogs on. Despite these efforts, and a cameo in last year’s Sundance-winning biodiesel sweetheart, “Fuel” Harrelson says he “lacks leadership skills” and “could do more” to aid the planet. Now, I’ve never gardened naked … maybe in my underwear a few times. Holy cow on the 40-day fast!?! That is not something I could ever do. At the last raw recipe class I went to, there was a long-term raw foodie there who was very passionate about fasting and juicing regularly doing them and promoting the benefits. Problem was he was not a great representative for me because he looked sickly thin and seemed, uh, lacking in the energy area. Also, he hammered the importance of not driving during fasts and juicing detoxes lasting more than a day. Uh, yeah, not realistic! From the way he described the benefits of it, I got the feeling it was more a mental high than part of a journey to better health. 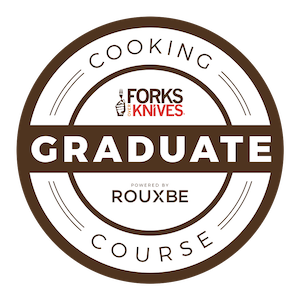 Luckily the raw instructor chimed in that she would never do one for more than a day, I don’t think I could even do that with active half-marathon training. With everything I’ve read on fasting and juicing, I’m not convinced that it is truly beneficial to health and maintaining a diet packed of whole foods cleansing enough. In fact I’m nervous of the damage fasting or juicing would do to my metabolism. Anyway, here’s another raw success story that I enjoyed reading, though not so much the reason she initially tried the diet was to lose weight. I have a lot more energy, I don’t feel overstuffed however, I am rarely hungry and my whole family benefits when mommy is healthy and happy! Besides the best part is I have lost over 24 pounds since January and I am still going. I am leaner, stronger, and more fit than I have been in years. A positive success story with many good points about a high-raw diet and the positive influences it can have. 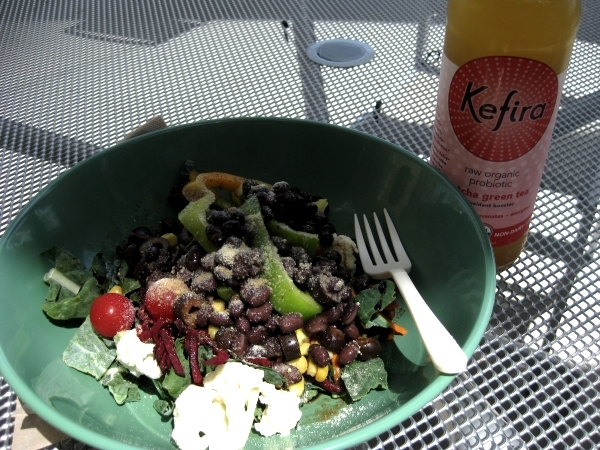 I had another splurge lunch at Whole Foods today and tried something new that was where Kombucha used to be. KeVita Kefira Matcha Green Tea. It was $3 on sale, so a pretty big splurge. At 40 calories per serving, it was lighter than a Kombucha, but the lack of sweetness reflected in the flavor. As for the flavor – ick! It was bitter and sour, not sweet at all. Not like a champagne as Ani describes her homemade kefir and I really hope my homemade kefir comes out sweeter! But, like Kombucha, this had a pleasant mellowing affect on my insides and mellowed my appetite for the rest of the afternoon at work, I wasn’t tempted to snack at all. My splurge lunch was a treat to myself because I was on a shoe mission to nearby DSW Shoes. I’m looking for new running shoes and am very close to ordering Saucony Kinvara’s. But athletic shoe sizing can be a PITA as each company seems to have their own definition of what my size is. I’ve read that one should get 1/2 larger in running shoes and not. It doesn’t help that I have large feet by women’s standards being between 10.5 to 11. So I decided to try on various Saucony styles as DSW before ordering, naturally they didn’t have the Kinvara’s or even any Saucony’s in 10.5, but they had plenty of 10s and good thing I tried them on because they fit me perfectly, better then my 10.5 Asics. Ugh, why can’t shoe sizes be more standardized? But I feel much more confident about what size to order. 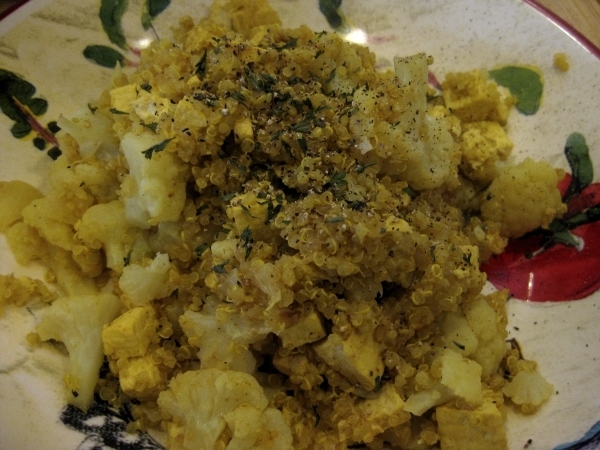 I added tofu cubes and fresh cauliflower and simmered with the curry seasoning a little longer to remove the extra moisture from the tofu and replace it with curry goodness – the plan worked nicely, the tofu absorbed the flavor while the curry was not overkill. It was perfect topped with parsley and pepper. Staying hydrated in the summer heat is a huge issue for me while running, I have to carry some water with me on longer runs and have been trying to find the perfect solution to do so. Really, there is no perfect solution, I’ve tried a running belt with a bottle, but the bouncing annoys me and a water backpack is too hot. But my latest purchase is much closer. 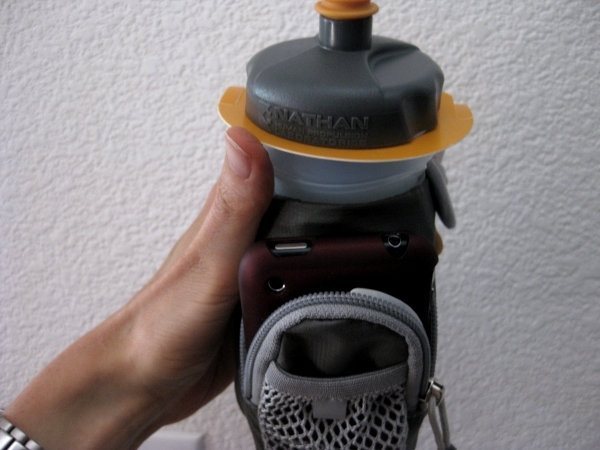 Nathan Quickdraw Elite handheld water bottle. The pocket is just big enough to jam an iPhone and has a key clip, very rare for handhelds, and it seems to stay tightly on my hand. I took it on a 4 mile run tonight and was very happy, the phone stayed tight while the earphone cord did not get in way. I’m right-handed, but found carrying it in my left felt better. 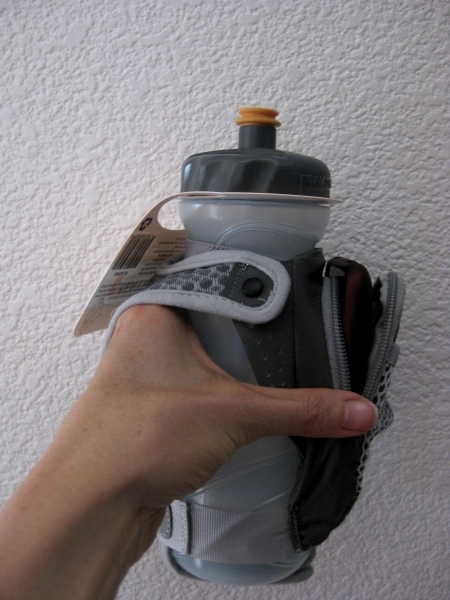 If you run, do you have a favorite hydration tool? I like that water bottle. I haven’t gotten high enough in miles yet to need hydration during running, but may use a belt one. (Love the Howard Stern reference. My hubby mentioned that very episode to me). I agree about the fasting. I haven’t even juiced yet and I’m a year raw (I’m starting to scour Craigslist for a wheatgrass juicer, though). I don’t know if I’ll ever do it. I may have done smoothies only for a day. It tends to bring emotional gunk to the surface, which I don’t like, lol. Looking forward to reading more of your blog! I love seeing what others are doing on a raw diet. I have been experimenting with gluten as well. I’ve cut out all processed foods and the only gluten i’ve been eating for a couple weeks is sprouted grain bread. I feel better, but I’m not sure if cutting it out entirely will make a difference. It’s interesting what you said about it being glue. It’s very tough on our digestion. 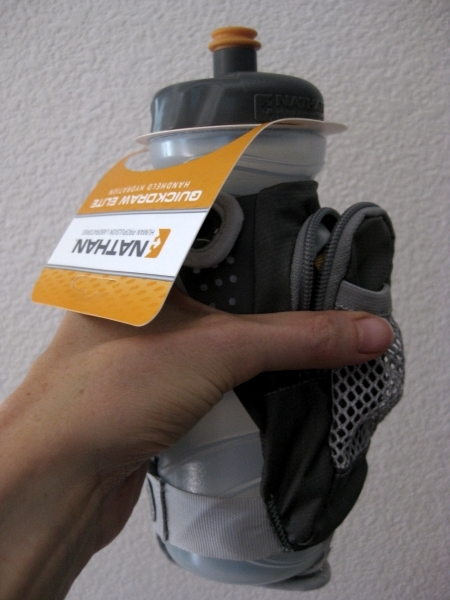 But, I have tried the Nathan water bottle and found it uncomfortable to hold in my hand. I prefer the camelbak, but only for runs over 5 miles. Less than that and I just make sure I’m hydrated before heading out. I love the info on your blog, I’ve already learned so much. Have a beautiful rest of the week! raw vegans who look sick promoting fasting. not good for the cause as a whole. ugh. I have never fasted, feasted, etc. and have NO intention of it. I am too lean to not be eating..my god, in 24 hrs i drop like 3-4 lbs…some water, yes but not good! oh kefir…ferment it maybe 20% less than whatever it tells you to. that will prevent it from being sour/tart and it will remain sweeter and the yeasts wont have eaten all the available sugar. 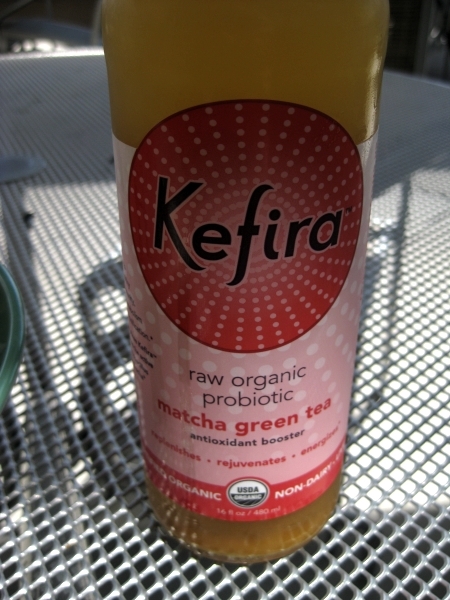 And IMO water kefir is maybe? like champagne but not really and coconut milk kefir is NOTHING like champagne so remove that little script from your brain b/c otherwise you will be disappointed :) kefir’s good but it aint champagne! I’m going to keep my eyes out for the Kefira. it looks good! I love my Nathan Quick Draw! I don’t use it as much as I should tho. Thanks for reminding me! I also like my camelbak…but if I’m running anything less than 6 miles, I tend not to take any form of fuel or hydration. As long as I am properly fueled and hydrated beforehand. Your body really adapts to how you train, so I just don’t mess with it for shorter runs. Ooh seriously must have that bottle carrier! Heading over and clicking the purchase button now on that. I too hate the belt clips. I have an arm band for the iPod, but nothing for the water bottle if I take one. That quick draw looks like a great running tool! wow very informative post christine! you got me thinking about gluten quite a bit now. woody is a bit crazy doing a 40 day fast but good for him for being able to! glad you had a good run-that bottle seems great. LOVE that water bottle, I love that it holds an iphone! I need one of those water bottles!!! I miss kombucha, I hope it comes back asap, nothing can replace it!! I have that same water bottle! It’s good for my shorter runs, but my CamelBak is the only thing that can help me on my long runs! 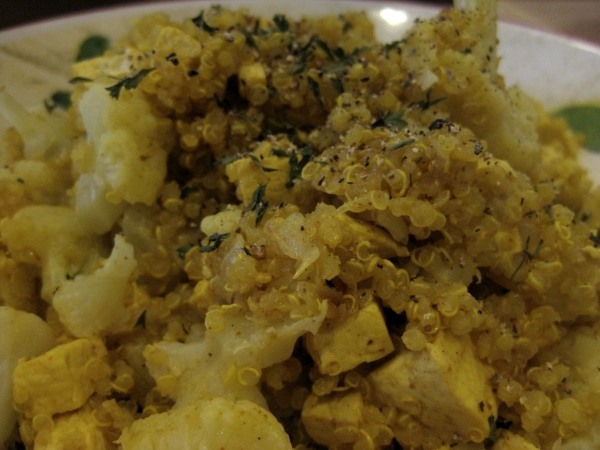 There’s no doubt in my mind that a high-raw diet is optimal for most people (physically)! I didn’t know that about gluten though. It’s weird- ever since I started blogging, I’ve naturally started eating less gluten. I think it’s because of sites like yours (and other GF sites) that expand my palate for other things! I agree with you on fasting. Granted, I’m not very informed on the issue, but it seems to me that our bodies were built to process foods and naturally cleanse and detoxify. As long as you’re eating whole foods and not being too demanding on your body’s systems by eating crap, I don’t think you or anyone else has much to worry about. The mental component of fasting is very interesting, though. I miss kombucha! I didn’t have it that often, but it was a nice treat. I spotted some in Idaho and scooped it right up. Hmm I’m not a huge fan of long fasts either (I like real food. And chewing!). One day is fine but 40?? Isn’t the body lacking major nutrients then?! I read a lot about gluten and I’m also a bit undecided. And confused. However, I think that cutting back on processed food in general is good (though I’m not going to give up my beloved pasta! ;)). Loving the new water bottle! I need to get one for the gym- a sigg just doesn’t work when you’re running on the treadmill or at spin class! That is really interesting about gluten. I’ve never tried not to eat it, but maybe I should give it a go for a week to see how I feel. One thing I notice is that I’m pretty much always a little tired. Maybe that would help?!?! I do love my oats though…don’t they have gluten?